Only earthworks remain of Castle Neroche and the entire site is extensively overgrown by trees. A farm has also been established in the bailey of the former castle. Nevertheless the broad layout of the fortification can be appreciated from the surviving earthworks. Strong footwear is recommended! Notes: The castle remains are found within woodland under the control of the Forestry Commission. The whole area is known as ‘Castle Neroche’. The fortification itself isn’t sign posted but can be accessed by following any of the main tracks through the woodland. Cars should be parked at the dedicated car park or at the lay-by detailed above (alternative option). Motte Summit. The summit has a break in the treeline giving you a glimpse of the impressive views this castle once commanded before the area was overgrown. Originally a hillfort, Castle Neroche was later converted into a Norman military outpost for suppression of the south-west rebellion in 1067-9. 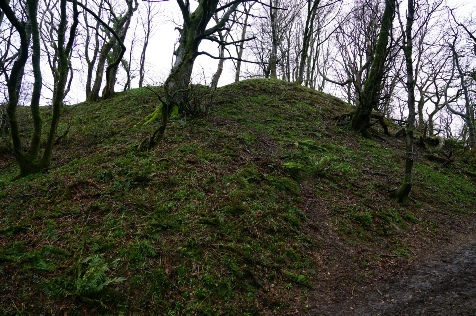 Later in the eleventh century the site was upgraded into a motte-and-bailey fortification but was only occupied for a few decades before being abandoned. It was briefly re-occupied during the Anarchy. 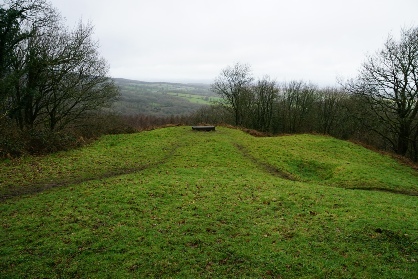 Castle Neroche occupies a steep scarp of the Blackdown Hills overlooking a major route into the south-west. Although today the views are largely obscured by trees, this would not have been the case when the first fortification was established on the site. This initial structure was a large hillfort and settlement enclosing around eight acres. Precisely when this was established is unclear although the assumption is an Iron Age origin. Although the vast defences of the former fort had long since been abandoned by the time of the Norman invasion, some form of settlement may have continued on the site. If so the populace were evicted when William I (the Conqueror) arrived in the area around 1067 to suppress a major Saxon revolt centred on Exeter. His castle took the form of an earth and timber ringwork fortification built in part of the former hillfort. The new structure was a significant undertaking with estimates suggesting labour equivalent to 13,780 man days required for its construction. It was large enough to garrison a field army including ample stabling facilities for cavalry. The ringwork was later upgraded into a motte-and-bailey fortification probably by Robert, Count of Mortain. He was brother to William I (the Conqueror) and acquired vast swathes of territory in the south-west. Along with other modifications - including the construction of an outer defensive work and a barbican - it is possible he sought to recycle the site into an administrative centre. If so it does not seem to have been successful as the castle was only occupied for a short period of time and no civilian settlement grew up around the facility. It was probably abandoned shortly after these modifications with Montacute becoming the administrative centre for Somerset. The site was hastily re-fortified in 1139 as England descended into the civil war known as the Anarchy. Four years earlier, Henry I had died leaving only a daughter - Matilda - to succeed him. Although the King had made his leading magnates swear allegiance to his daughter, upon his death most of the barons switched their support to the former King's nephew, Stephen of Blois. For a few years it looked as though Civil War may be avoided but when Robert of Gloucester, half-brother to Matilda, supported her cause it led to conflict. At this time of uncertainty numerous fortifications, mostly motte-and-baileys, were established. Castle Neroche was re-commissioned at this time with the former motte of the Norman fortification being re-used. A round stone tower was built which was unusual as fortifications required in response to an imminent emergency were normally built in timber given the (significantly) longer time-scales for constructing a masonry structure. It seems likely then that Castle Neroche was not perceived to be in any immediate danger although this would seem at odds with the action occurring only slightly further to the east in the 1139-41 period. The Anarchy was eventually settled with the agreement that King Stephen would rule for life and then be followed by Matilda's son, Henry II. He came to the throne in 1154 and immediately started to restore Royal authority. In particular he ordered all castles built without permission to be demolished or de-militarised and it is likely that Castle Neroche went out of use at this time (although it was briefly mentioned in a charter of 1298 as the 'Castle of Rachich'). Stone was robbed from the round tower leaving just earthworks and the site remained abandoned until a farm was established in the bailey of the former Norman castle during the nineteenth century.